Turbo trainers are most common in cyclists garages so they can work out and stay fit during the winter months. It’s important to test trainers in their natural environment so this is exactly what we have done here (i.e. a slightly cluttered garage). If it is not possible to setup and use the CycleOps Fluid 2 turbo trainer in a garage then it will not be of use to a lot of you reading this. Of course indoor cycle trainers can be used at any time and often are used to carry out specialist exercises such as sprint training and they are also commonly used for pre-race warm-ups and cool-downs. But for the amateur (but still serious) cyclist turbo trainers will be utilised most in times when it is not possible to get out on the open road. 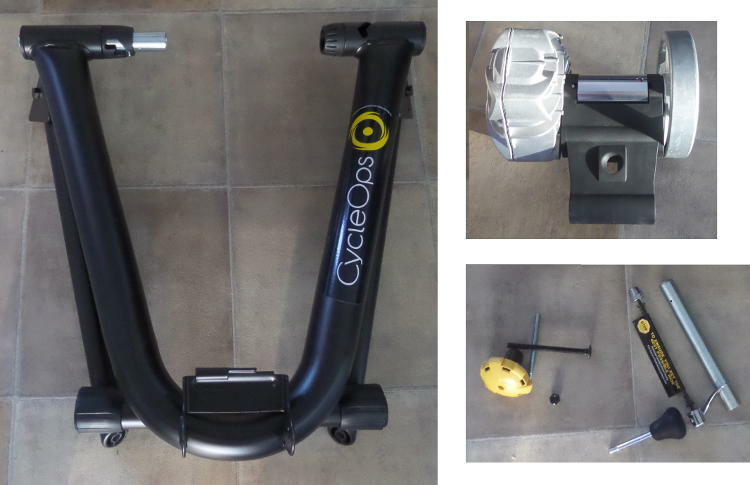 1st impressions of the CycleOps Fluid 2 turbo trainer. CycleOps state that this is a very quiet trainer that uses fluid resistance technology to create smooth and realistic progressive resistance. From our first impressions we can say that this is a quality looking and very sturdy piece of kit. 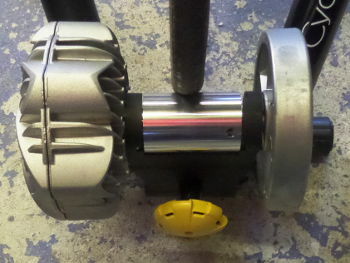 The resistance roller on which your bike tyre rotates has a nice big radius that should help increase the tyre contact surface area that will reduce the chance of slippage during cycling as well as reduce the noise it produces (because the cylinder will spin a fewer number of times compared to a cylinder with a smaller radius). This looks like a trainer built by a company with years of experience. Its design is polished and very robust, which is important if it is going to be thrashed during heavy workouts. 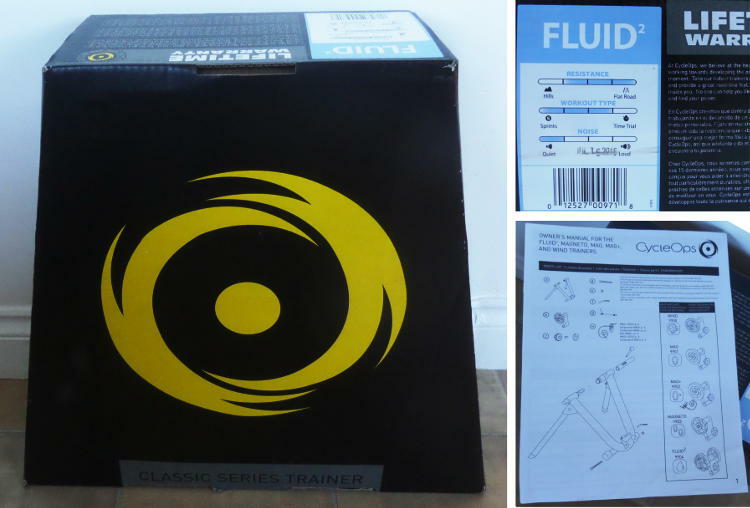 The CycleOps Fluid 2 turbo trainer gets amazing reviews on all retailers websites and across cycling blogs. So we were very excited to get our hands on the trainer in questions to see what it is really like. See Reviews and Best Prices at Amazon.co.uk here. See Reviews and Best Prices at Wiggle Cycles here. Straight away we knew this was a good product just from the packaging. It may seem like a silly thing to pick up on but previous trainers we have looked at came in boxes that were not designed with ease in mind. It was a case of trying to slide heavy and irregularly shaped items out of a tight box, and it was even harder to put back in the box. The CycleOps Fluid 2 packaging was compact, neat, and most importantly the whole top of the box came off so the trainer could be easily removed. It just tells you that they are thinking about the whole user experience and if they get the packaging right then we can be confident the actual turbo trainer will be right. The trainer does not come fully assembled, which is a little bit of a pain, although to be honest it did not take long to put it together. The main frame and support legs came as one part, but the resistance unit was separate and you also needed to setup the wheel locking pin. All-in-all it took about 5 minutes to fix together. One thing to note was that the locking pin was a bit tight and took a little force to slide into place. The Fluid 2 turbo trainer uses a fluid resistance mechanism, as its name suggests. This means that it should be quieter than other types of trainers and also the resistance you feel should be pretty realistic and the resistance curve should be progressive and smooth. The trainer was definitely not silent, but the noise levels were fine even when pushing it. All trainers make noise and the fluid 2 was quieter than others we have tested, although to be 100% honest it was not a huge difference. As you pedal harder and spin the resistance roller faster the noise levels increase but never to a particularly high level. You will definitely not annoy any neighbours like you would with some other trainers, particularly wind resistance trainers. 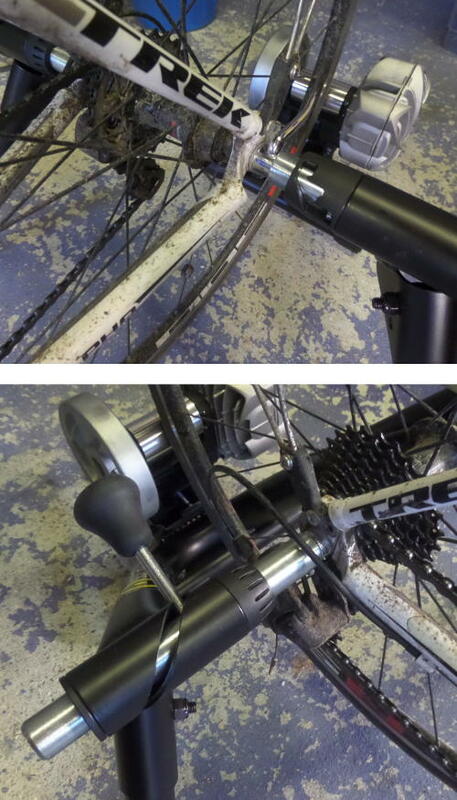 The mechanism of pushing the resistance rollers against the back wheel is the best we have seen. With other trainers we have tested there was either an element of guess work about how hard to push the resistance roller against the back tyre or the support frame was mobile, so your weight combined with the weight of the bike controlled how much force was applied to the roller (e.g. as with the Bkool One trainer we review here). There are pros and cons to the different mechanisms that push the trainer against your tyre, and the mechanism used by the CycleOps Fluid 2 means that you have a constant pressure on your bike tyre, and because of the ingenious tightening mechanism you know this pressure is perfect and optimal (more on this in a second). 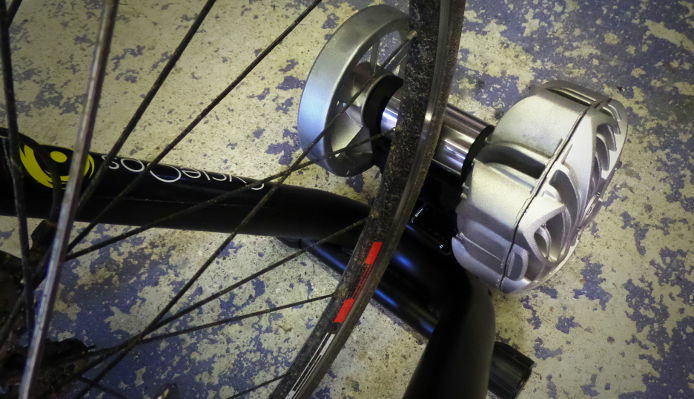 Fixing your bike wheel to the CycleOps Fluid 2 Turbo Trainer. The trainer itself has a positioning pin/rod on one side that has a choice of three positions. We used the third position (i.e. the widest position). On the other side of the trainer is a lever controlled fixation pin/rod. So once you have your wheel in position you simply slide this lever to lock your wheel into position. One concern I often have when using turbo trainers is knowing how much force to apply when pushing the resistance roller up against my bike tyre. Normally it is either complete guess work or at best there is a rule, such as turn the knob a certain number of times. With the CycleOps Fluid 2 you get a clutch knob that you turn to push the resistance roller up against the tyre. You simply keep turning and when the force is perfect the knob clicks and turns without applying any more force. I really love this mechanism and it takes away any guess work and you know you have the optimal pressure between the roller and your tyre for the best workout and performance. The Fluid 2 is for the serious trainer who wants a solid and realistic (cycling) workout. The resistance is as close to road-realistic as you will get from a turbo trainer, and the resistance is also progressive, again just like it is on the open road. As you ride you simply shift up through your bikes normal gears and the resistance will increase accordingly, and when you are in your top gear you will really feel the strain in your legs. The Fluid 2 turbo trainer is good for all types of workout, but is particularly suited to sprint training as well as stamina training. You can either simply cycle to your own agenda or there is the opportunity to add a little more hardware that opens up a whole new world. What CycleOps say about the Fluid 2. Precision-machined alloy roller reduces tyre wear and slippage. Features clutch knob for perfect roller to tyre tension each ride. CycleOps VirtualTraining compatible. What does this mean? Simply VirtualTraining by CycleOps lets you ride on video routes with realistic pacing. It integrates GPS and Google Maps as well as synchroning route mapping and videos with actual outdoor terrain. What this means is that the faster and harder you pedal the quicker you progress through the route you are cycling. There are also online cycling communities and races. You will need to invest in additional hardware however to use the CycleOps Fluid 2 with VirtualTraining to get the most out of it. A power meter and a cadence/speed sensor will be required as well and an ANT+ or Bluetooth 4 receiver for your computer or smart phone/tablet. The CycleOps Fluid 2 is a great turbo trainer. It is smooth, robust, and if you want a road-realistic progressive resistance then you should look at this trainer seriously.